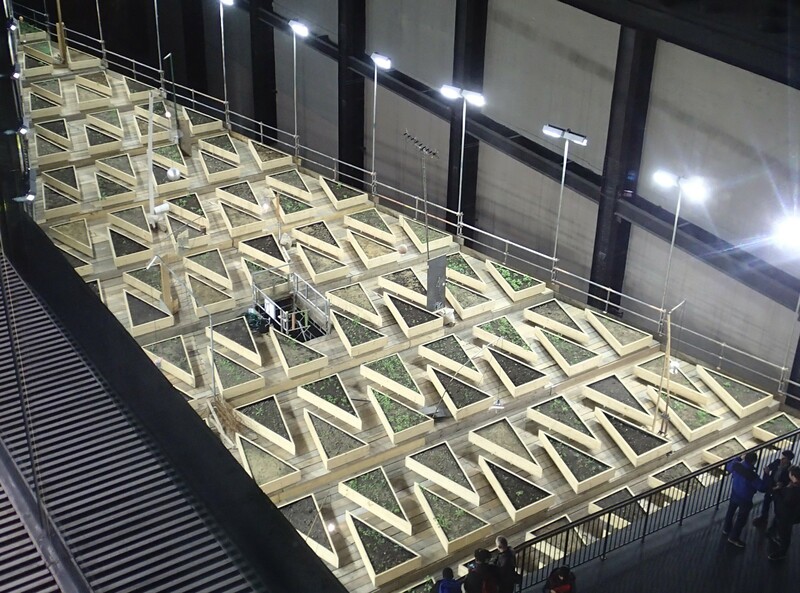 A visit to Tate Modern on Thursday to see the Alexander Calder exhibition, Performing Sculpture, provided surprising food for thought for someone interested in plants. For one thing, Calder’s Vertical Foliage sculpture looks very like the Maidenhair fern from which the Ginkgo trees I love (see Ginkgo – A living fossil) get their common name. Unfortunately the screen print of the mobile sculpture (below) gives no impression of the shadow it casts, which to me is an integral part of its beauty. The bigger surprise was Abraham Cruzvillegas’ Empty Lot installation, filling the massive Turbine Hall. 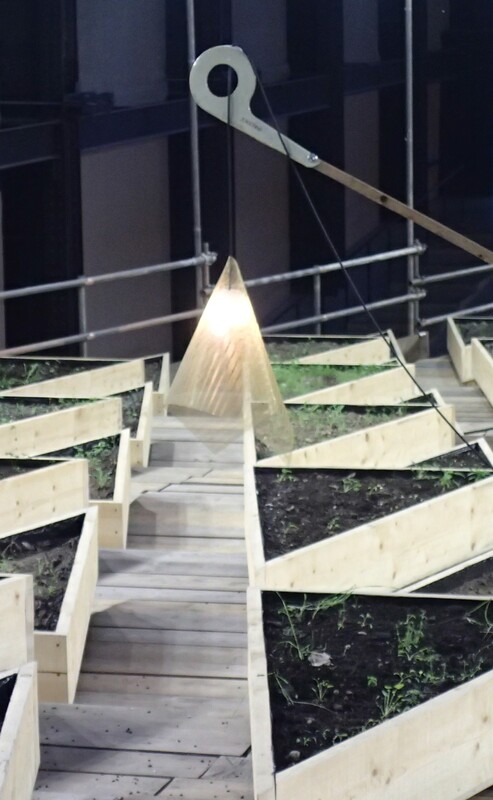 The premise of this work is fascinating – Cruzvillegas took soil from a large number of ‘parks, heaths, commons, green spaces and gardens’ across London and used it to fill triangular planters, arranged in a giant diamond bisected by the level one walkway. The installation will remain in the hall for six months, during which time the planters will be lit and watered regularly. 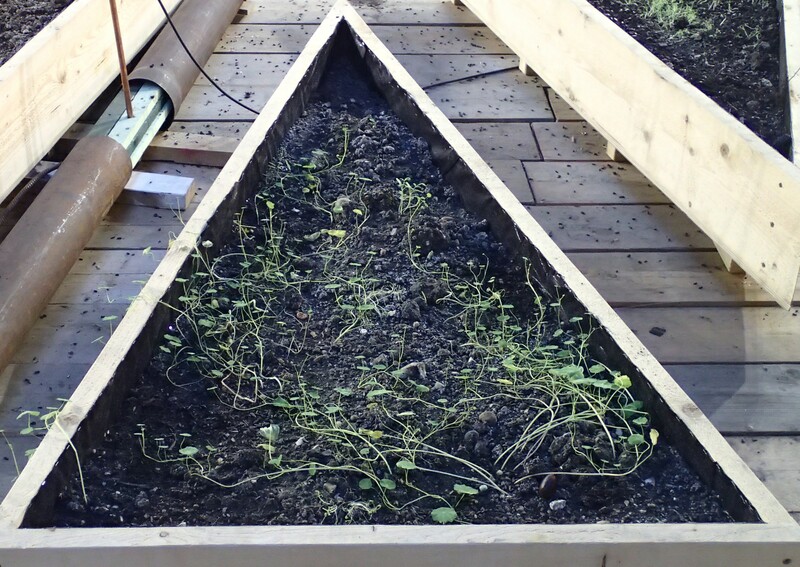 Nothing has been planted, however – what appears depends on the seeds naturally present in the soil or things that have been added by members of the public. I would have been sorely tempted to engage in a spot of seed bombing if I’d had the materials to hand! Of course, as a botanist, I’m interested in how the type of soil, seeds present already and levels of light will affect what grows. You can see that some of the soils contain much more organic matter than others by their darker colour but it is already clear that this is not the most important thing in determining whether plants will appear. That will largely depend on the provenance of the soil, though I did wonder if the planters next to the walkway are more likely to be successfully seed bombed! Some planters already have quite a lot of vegetation but it mostly doesn’t look very healthy – light levels are not high enough for some of the seedlings, which look etiolated – pale and ‘leggy’ – as a result of their quest for light. It’s not easy to get close enough to identify most of the seedlings but these look like they might be straggly Nasturtiums. The whole installation is lit by bright arc lights but some planters have additional lower level, more decorative, lighting made of recycled materials. These probably also provide some heat, which will speed up growth in the planters nearby. Not so much of a ‘fair test’ I suspect! 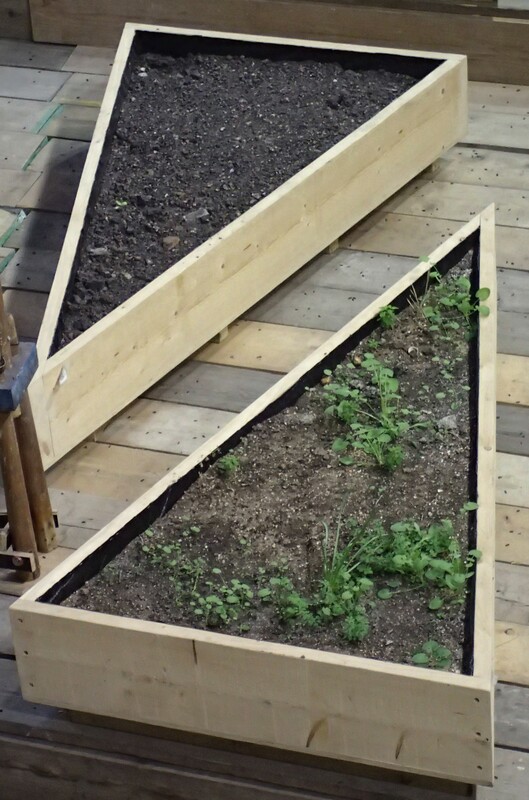 Of course I am missing the point here; the installation is based on the small plots of land known as chinampas, used by subsistence farmers in Cruzvillegas’ native Mexico. It is more about the possibilities every gardener sees when confronted with a new plot of land, and their hopes and expectiations for it, than about any kind of experiment!